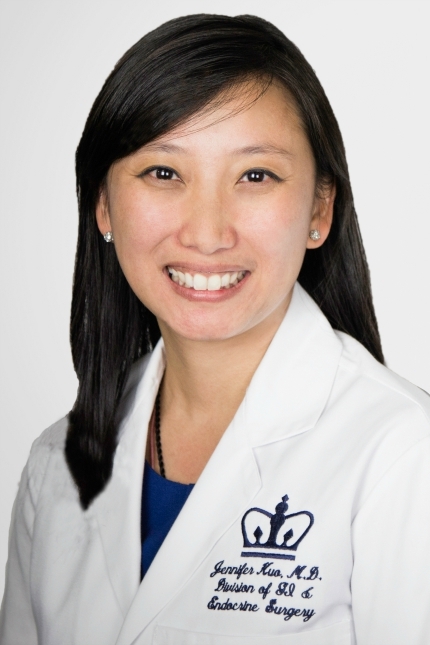 March 5, 2015, San Diego: Young breast cancer survivors face a significantly higher risk of thyroid cancer than the general population, according to a new study presented by Jennifer H. Kuo, MD, Assistant Professor of Surgery and Director of the Thyroid Biopsy Program at NewYork-Presbyterian/Columbia. In presenting her results to the Endocrine Society’s annual meeting, Dr. Kuo has contributed important clues about a long-suspected, but ill-defined link between these two cancers. Those who developed thyroid cancer did so at a median of five years after their breast cancer treatment. Compared to women with breast cancer alone, those who had thyroid cancer were younger at the time of breast cancer diagnosis. Women with both cancers were more likely to have had invasive ductal carcinoma and to have received radiation therapy during their course of treatment. Further study will follow to better understand the breast cancer- thyroid cancer link. In the meantime, Dr. Kuo says that clinicians should be aware of this increased risk for thyroid cancer when taking care of breast cancer patients. “Doctors may want to add a thyroid exam to patients’ physical exams in the years following treatment for breast cancer. If a patient has a nodule they wouldn’t otherwise biopsy, a previous history of breast cancer might be a good reason to take a biopsy as a precautionary measure,” she says.